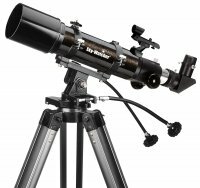 The Sky-Watcher 70mm (2.8") f/5 and 80mm (3.1") telescopes are two-element, air-spaced, fully multi- coated objective, refractors. The 80mm f5 is a well- proven performer which gives "rich- field" views of star fields, clusters, nebulae, bright galaxies, planets, the Moon and (with correct filtering or by projection) the Sun, as well as excellent terrestrial views. Both telescopes give images which are crisp and with very little chromatic aberration. One of the greatest assets of these solidly built telescopes is portability. The light-weight optical tubes (1.25kg; 2.8lbs for the 70mm and 1.5kg; 3.3lbs for the 80mm), and the compressed lengths of about 380mm (15") and 480mm (18") make them "take it with me" telescopes. Their optical tubes can be adapted to fit into an airline carry-on bag, or into a hiker's backpack. Whether they are to be used as a beginner's telescope, a "rich-field", a backup, a guide scope or a travelling telescope, the very reasonable prices make them choices to seriously consider. They are quick and easy to set up and the low- maintenance, enclosed optics come fully collimated from the factory. Alignment of the finderscope and polar alignment of the optional equatorial mount are all that are needed to start viewing. The optical tube assemblies are held firmly by hinged, felt-lined "tube mounting rings" which allow easy installation and optical tube rotation and balancing. Mounting one of these telescopes on the supplied aluminum alt-azimuth mount or a photographic tripod is quick and simple with the supplied "multi-function mount plate". Both telescopes perform well as a fixed aperture lenses for both astrophotography and terrestrial photography. The "fast" focal ratios, combined with today's high speed films, make them useful for capturing lunar and solar eclipses as well as nature photographs. With a suitable T-adapter, a camera can be connected directly to the T-mount thread on the eyepiece holder and a supplied 60mm (2.4") extension tube allows closer focussing for terrestrial photography.